Supreme Court surprises. Myth or reality? How would a successor to Supreme Court Justice Antonin Scalia vote? If President Obama manages to get a hearing on a nominee, will he or she reveal anything? Typically, members of the Senate Judiciary Committee try to pin nominees down on how they might vote on crucial issues. Their writings and previous rulings are literally scrutinized and figuratively x-rayed, examined microscopically and carbon dated. Will a new nominee be–as progressives hope and conservatives fear a consistent member of the “liberal” wing of the Court? The answer, history tells us, is: We don’t know. That’s not a very satisfying answer, especially if you’re on the Senate Judiciary Committee and hope to be able to say, years from now, “I told you so.” But among legal scholars, journalists and Supreme Court junkies, judicial predictability is a subject of debate. One way to feel better about a prospective Supreme Court Justice nominated by a President you don’t much care for is to invoke the common wisdom that many Justices, after ascending to the high court and the life tenure that goes with it, betray the politics of their appointing Presidents. And it is true that history reveals a fair number of Justices who defied expectations. But there is much less to this than meets the eye. With few exceptions, the “surprise” Justices were either picked for non-ideological reasons or were foolishly misjudged by the President making the appointment. Eisenhower was referring to Earl Warren and William Brennan. He chose Warren, who was governor of California, as part of a political deal. (Brennan had supported Eisenhower’s bid to become the Republican Party’s nominee.) Ike chose Brennan—a Democrat—because he was a northeastern Catholic, for the demographics. Historians suggest that Eisenhower should not have been “surprised” when Warren and Brennan became the leading forces behind the aggressively liberal Supreme Court in the 1960s, because he hadn’t chosen them as a way of perpetuating his own ideology. In other words, Souter wasn’t a surprise: Bush just blew it. Among recent justices, Sandra Day O’Connor stands out for the surprise she sprang on Ronald Reagan, who appointed her, and on Republicans who initially supported her. Before her appointment to the court, O’Connor was on record as unequivocally “pro-life.” On the court, however, she voted against every effort to overturn or alter the 1973 Roe v. Wade decision. Appointed by President Nixon in 1970, Blackmun initially voted consistently with Chief Justice Warren Burger. As time went on, though, his voting record diverged from Burger’s. The turning point came in 1973, when Burger assigned Blackmun the job of writing the majority opinion in Roe v. Wade. The public’s negative reaction forced him to defend the decision, and that defense—and it’s logical extensions, gradually led him to adopt positions far different from those with which he arrived on the court, and he came to champion the rights of women and the poor. Another case in point is Byron “Whizzer” White. Appointed in 1962 by President Kennedy, who had met him at Oxford, White was thought to be a moderately liberal justice. A decade after Kennedy died, White cast one of only two dissenting votes against Roe v. Wade. Finally, an anecdote published in the National Catholic Reporter exemplifies the difficulty of predicting how a Supreme Court nomination will turn out. In a recent article in The Washington Post, Stewart Spencer, political strategist to President Gerald Ford, recalled the bishops’ involvement in the selection of Justice John Paul Stevens in 1975. Stevens went on to become the court’s most stalwart liberal vote, including defense of Roe v. Wade. Being appointed to the Supreme Court for life may be an ideological liberator, say some observers. This lifetime factor may contribute to what some call the “dirty little secret” of Supreme Court tenure: Many justices, no longer needing to build a record based on a particular ideology, turn out quite different from what anyone thought they’d be. No matter how carefully they’re screened, goes this theory, any judicial nominee could undergo a transformation in either direction after assuming a life-tenure seat on the high court. But a justice doesn’t have to do a full 180-degree turn to exhibit a change in course. According to an article in the Northwestern Law Review: “…contrary to popular wisdom, virtually every Justice serving since the 1930s has moved to the left or to the right” [of where he/she presumably began]. Others disagree with this theory of “judicial drift.” “Most justices’ careers display consistency rather than drift,” says Christopher Eisgruber, provost and professor of public affairs at Princeton University. Another scholar’s analysis of 22 justices appointed from the 1950s onward found that in all but four or five cases, the justices’ records were close to the ideology of the president who appointed them. 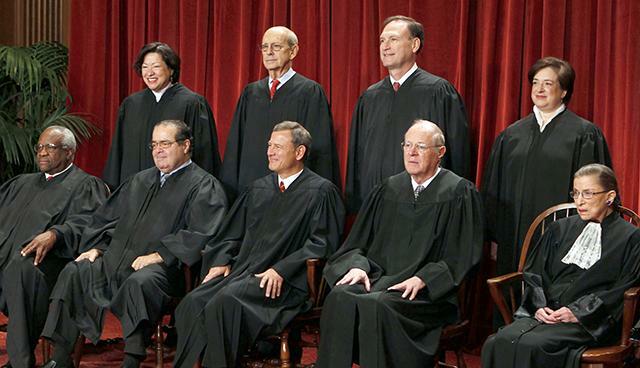 Will President Obama get what he wants in his next Supreme Court appointee? We’ll get back to you with the answer to that question in, say, 30 years.